How many mountains can we mine? 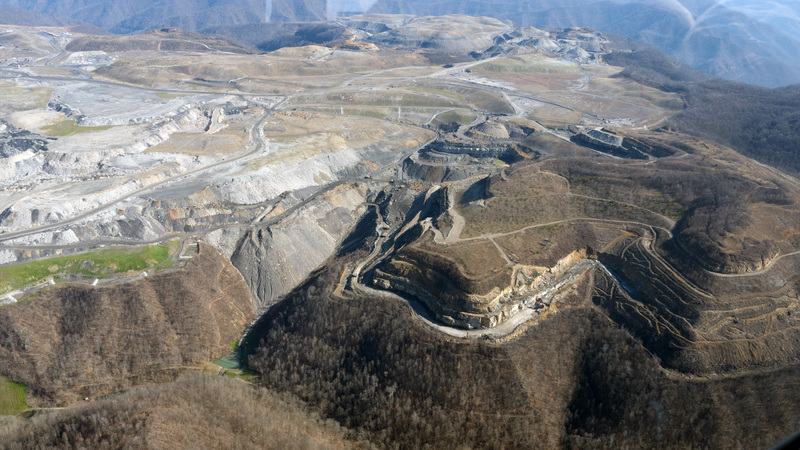 July 26, 2012 by Ken Ward Jr.
Decades of mountaintop-removal mining may have harmed aquatic life along more than 1,700 miles of streams in southern West Virginia, according to new research. Mining companies have converted 5% of the region to mountaintop mines. The resulting water pollution has caused so many sensitive species to vanish that 22% of streams may qualify as impaired under state criteria, the researchers report. These analyses suggest that the many individual mines in the region are having additive effects and that more attention must be paid to the cumulative impacts of surface coal mining in this region. Folks who are following these issues closely may recall that Dr. Bernhardt testified about this work in one case pending in federal court and in one appeal before the state Environmental Quality Board. In those cases, she was an expert witness for environmental groups challenging mining permits. How about a non-pay link? As has been discussed many times before on Coal Tattoo … most scientific journals (well, many of them) have subscription only websites. I don’t control that, and I also don’t violate the copyright of journals. However, because drafts of this work have been discussed in previous court cases, the industry law firm Jackson Kelly appears to have posted a previous draft (not the published version) online here, http://www.jacksonkelly.com/JK/pdf/Version%201.pdf … I have not compared the two to see what differences there might be. In the first quote listed above, the very first sentence says: “Decades of mountaintop-removal mining may have harmed aquatic life along more than 1,700 miles of streams in southern West Virginia, according to new research.” Now the one word that i would love to point out in that sentence is the three letter word, “MAY”. May have harmed aquatic life? So did it or not? Then it goes onto say: “The resulting water pollution has caused so many sensitive species to vanish that 22% of streams may qualify as impaired under state criteria, the researchers report.” ??? So it “MAY” have caused sensitive species to vanish and that “MAYBE” 22% of streams AND ONCE AGAIN, “MAY” qualify as impaired under state criteria. Do we really want to call this research? I am surprised this article was published in an engineering magazine. Of course I haven’t taken the time to read the entire article i am just reading the carefully selected sections that Mr. Ward likes to publish. Thanks for the so informative info! It’s certainly not helpful for folks to comment on — indeed attack — published scientific papers that they can’t be bothered to read … Ken. I really can’t see much point in bemoaning the use of qualifiers like “may” or “might” in this context. After all, to have the certainty that “Common Sense” apparently desires here one would have to have measured all of the factors that can contribute to stream impairment or the direct death of individual organisms or shifts in community structure, including the elucidation of processes and patterns which have yet to be discovered. Why didn’t the authors do that, I wonder? Actually, no one is wondering that. If what “Common Sense” desires is a complete summary account of the fate of every atom and molecule in the system, including those atoms bound up in coal seams and those bound up in yet undescribed species of Baetid mayflies or in the diet of humans whose house plumbing is materially linked to surfacewater, then I suppose no amount of detail would suffice in order to justify the argument made in this paper. However, and fortunately, science doesn’t work that way. And, it never has and never will, for reasons that I would argue are obvious to onlookers. Not a bad study, and not a contested finding. But it is poor science, nonetheless. Both GLIMPSS and TITAN are tweaked towards detecting responses to ionic concentration. A wheatstone bridge did that effectively a long time ago. What is not really being addressed it an attempt at an objective determination of what constitutes an impairment. And that is what kicked this off, of late (the past few years, since the Pond Passmore conductivity surrogate for sulfates study) – an illegal power grab by EPA in attempting to establish a numerical limit on ionic concentration by referencing a de-facto, epidemiological database survey instead of firmly establishing a cause-effect and dosage response. Not even an attempt, that I have seen, to establish it for a single taxa. Of course there are logistics and experimental design limitations to this, but none so great that should require contorting the same dataset into predictable outcomes. And none so great that we should excuse the overreach of a Federal agency. Particularly not the same one that so gently brought us Corexit in the Gulf.